From the turkey, dressing, and green bean casserole to the sweet potatoes and pumpkin pie, it is easy to understand why we look forward to the Thanksgiving meal all year long. While delicious, this indulgence can also pack on the pounds. 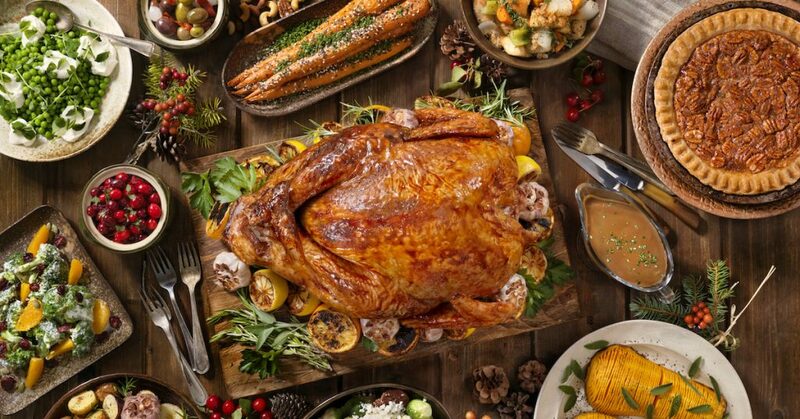 In fact, the average person eats approximately 3,000 calories and 229 grams of fat during a traditional Thanksgiving meal. For reference, the U.S. Food and Drug Administration recommends adults eat no more than 2,000 to 2,500 calories per day with no more than 65 to 80 grams of total fat. The following guide will help you plan a healthy Thanksgiving dinner menu that won’t leave your guests feeling disappointed. When planning your healthy Thanksgiving dinner menu, remember to be realistic and focus on the goal of weight maintenance rather than weight loss. Serve a large salad that includes a variety of dark, leafy greens. Instead of mashed potatoes, serve roasted turnips or sautéed collards, spinach, or chard. Swap out the traditional green bean casserole for sautéed green beans topped with toasted almonds and a touch of fresh lemon juice. Roast your yams or sweet potatoes instead of serving them candied or in a casserole topped with marshmallows. Use egg substitute in place of traditional eggs. Opt for low-fat or reduced-fat dairy products. Choose soups and broths that are reduced-sodium or that have no salt added so that you can control the salt content. Use olive oil or nonfat cooking spray instead of butter or margarine. Flavor your turkey with an herb rub instead of butter to lower the fat content of your healthy Thanksgiving dinner. Just 5 ounces of turkey provides you with 40 grams of protein and half of your daily requirement for folic acid. Folic acid is especially important for women who are pregnant or who may become pregnant since it can help prevent neural tube defects, such as spina bifida. A 5-ounce serving of mashed potatoes contains 22 percent of the recommended daily allowance of vitamin C.
Green bean casserole is rich in iron and calcium. You can get more than 100 percent of the recommended daily allowance of vitamin A with a half-cup serving of sweet potatoes with skin intact. Cranberry sauce and wine both contain antioxidants that can help you fight infections, lower your cholesterol, and prevent blood clots. A slice of pumpkin pie, equal to one-eighth of a 9-inch pie, contains just over 2 grams of fiber and 5 grams of protein. Instead of taking a nap in front of the TV after eating your healthy Thanksgiving dinner, make it a family tradition to engage in some sort of physical activity, such as a round of touch football in the backyard or a walk around the block. It is not unusual to experience some nausea or even diarrhea after you overindulge in food or alcohol or deviate from your normal dietary pattern. In most cases, the symptoms will lessen as you digest your meal. If the symptoms persist or worsen, it may be a sign of food poisoning, a gastrointestinal virus, an ulcer, or another problem with the digestive system. If you should experience these types of symptoms, you should see a medical professional as soon as possible for diagnosis and treatment. The FastMed family would like to wish you and your family a happy and healthy Thanksgiving. Our clinics are also open seven days a week, 365 days a year, including holidays, to serve you. We have convenient locations located throughout Arizona, Texas, and North Carolina, so the help that you need is always nearby. We also offer online registration and check in so that we can get you back to your family and holiday activities as soon as possible. *Outside labs, vaccines, and durable medical equipment are not included in the pricing above and are charged separately as add-ons. Participation in self-pay pricing cannot be used in combination with commercial insurance benefits nor can it be provided to patients participating in U.S. government health plans. Please note that some procedures are excluded from self-pay pricing.